In compliance with US Federal and NJ State Law, Waldwick High School administers the New Jersey Student Learning Assessment (NJSLA) for English Language Arts (ELA), Mathematics and Science. Formerly known as PARCC, NJSLA is the same assessment and is testing the same standards. For the NJSLA test for English Language Arts (ELA) and Mathematics (Algebra/Geometry/Algebra 2), ONLY 9th and 10th graders are expected to participate in the testing. This is a change from last year. The NJSLA (Science) is only for 11th graders. 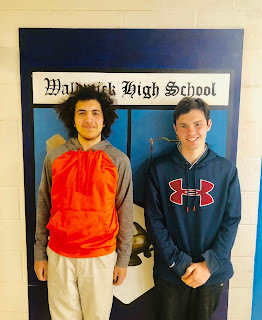 Gabriel Masarwa and Joseph Saffioti, members of the Class of 2020 who will be honored by the National Merit Scholarship Program in the fall of their senior year for achieving a high score on their PSAT's. With a Selection Index score of 212 or above, these high performers have shown outstanding academic potential. Of the 1.6 million program entrants, each of these students is among the 50,000 highest-scoring participants who will be recognized. Congratulations to Mrs. Taylor 2018-2019 WHS Teacher of the Year! Garage Sale Sponsored by Liberty 100 Realty. Signs will be provided by Liberty 100 Realty for participants. Questions call/text Mary Beth Nappi, WEF President @ 201-693-7841 or email waldwickwef@gmail.com. Register below. From the Donation Screen click the drop down and choose Townwide Garage Sale. Please be sure to add your name, address, email and contents to the Notes Section. Sponsored by Northwest Bergen Regional Health Commission and the Waldwick Board of Health, this program is aimed at helping parents support their children as they go through the college application process and enter their first years on campus. Topics covered will include alleviating stress and anxiety during the application process, addressing time management challenges, remaining connected with others, identifying necessary school resources, and navigating safety and mental health on campus. There will be opportunities for questions and discussion throughout the presentation. For questions or more information, please contact Northwest Bergen Regional Health Commission at info@nwbrhc.net. Dear Parents/Guardians:The Waldwick Board of Education offers an internet-based payment system that allows you the option of paying for your child’s lunch on-line, via credit card or ACH (electronic check). This service also allows you to receive automated emails detailing your child’s account balance, which items they purchased, and if their balance is low. Additionally, like EZ-Pass, there is an “auto-replenishment” option which allows you to set up a low-balance threshold and automatic debit amount to replenish your child’s account. More info on this system can be found at http://www.myschoolbucks.com Note that there is an internet convenience fee associated with payment by credit card or ACH, whereas there is no fee to put money on account at the register by cash or check. On Monday, April 15, the Waldwick Stigma Free Coalition in partnership with Waldwick High School and Waldwick Middle School are proud to present, “Minding Your Mind,” an organization who is committed to providing mental health education to adolescents, teens, young adults, parents and educators.